Callisto is the second largest moon of Jupiter and the third largest in the solar system. It is one of the four largest moons of Jupiter which are also known as the Galilean moons. These moons were discovered by Galileo in 1610. They are some of the largest objects in the solar system apart from the planets. 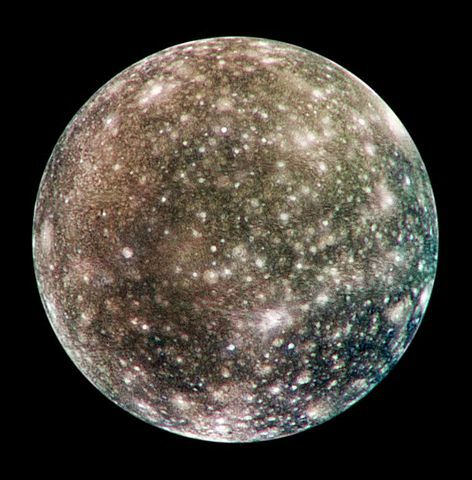 Callisto is made of equal parts rock, iron and ice. It has the oldest landscape and is referred to as the ‘dead moon’. It has no signs of geological activity like plate tectonics and volcanic activity. Callisto has the most heavily cratered surface in the entire solar system. It is tidally locked in its orbit around the Jupiter, so it always faces the same way towards the planet. Valhalla is the largest of all impact craters on its surface. It stretches around 3,800 km in diameter from the outer trough zone. It has a thin atmosphere which is composed mostly of carbon dioxide and probably molecular oxygen as well. The distance between the earth and Callisto is approximately 628,300,000 kilometers. When seen through a telescope, it is much brighter compared to our planet’s moon. The reason for this is its surface is made of a thick layer of ice which reflects sunlight more than our Moon. It has an orbital period of 16.7 earth days and an orbital speed of 18,400 miles per hour. It has an interior ocean likely made of water mixed with ammonia or salts. Declan, Tobin. " Fun Facts for Kids about Callisto ." Easy Science for Kids, Apr 2019. Web. 18 Apr 2019. < https://easyscienceforkids.com/callisto-facts/ >.